Hi there. Were you aware that Pebble Beach is coming up later this month, the fanciest week for American car collectors and owners all year, brimming with boutique shows and auctions? Yes. Among these events is the Mecum Auctions and, for your wellbeing, I have put together a list of cars that you will be wise to purchase. This is the auction that will have that one Ford GT that nobody can seem to own. That will be a fine distraction that will keep everyone away from the cars you need. Also there are lots of Lamborghini Diablos and over-restored pickup trucks to distract everyone else. 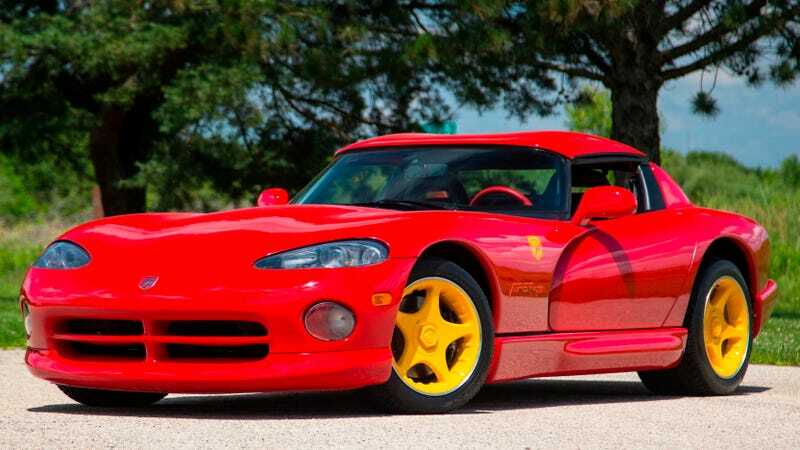 First, buy this Charizard-looking Dodge Viper. Drag $60,000 out of your wallet right now and hurl it at your computer if at all possible. Alright, good. Now here is a Nissan Pao, the Pike Car legend, probably the most adorable car of the modern era. They’re great. Your life would be better with one. No suggested price! Pull out a few grand for this. Also buy this Nissan S-Cargo, basically the same car but roomy and practical. Your fleet of vehicles is, I’m going to say it, unbelievably cool already. You are dangerously cool owning these three cars thus far, and you’ve spent less than what it costs to buy a mid-trim Porsche 911. I have some bad news. You are about to become much less wealthy, though at least more fabulous. There are many trucks at this auction. Most of them are boring. Not boring: this forward-control 1957 Willys FC150 Jeep. Jeep people love these things, and will do their best to bankrupt you on it. Fight them before the auction starts. Identify them by shouting in the parking lot, “how many bars does the Jeep grille have in it again?” They will all swarm you. Good, you have a truck. You have a sports car. You have an adventure car and also a practical small van. What you need now is a luxury car. What is luxury? Nothing is more luxurious than having to helicopter in a specialist mechanic to fix your car on the side of Route 7 up to Lime Rock Park, and as such, you should buy this 2000 Bentley Continental R Mulliner. It is of the last-gasp-before-the-VW-years era. It is great. I have never met an unhappy owner. Touch the red button. Put away $10-$15,000 for this new/old/recreation Offyette Sportster. It is small enough for your Flemish Giant to drive. It’s basically a go kart with an amazing body on it. I assume you have a Flemish Giant. If you were reading this post for consumer advice, you should have enough money to have a Flemish Giant, and if you did not already get one I would if I were you. Do not buy this 1977 Honda Civic for $20 to $30,000. This is not a recommendation but appreciate that auctions are alternate universes where rationality does not extend to prices. There are many retro heroes for sale at this auction, most of them being Lamborghini Diablos. Leave those behind though. What you want is this 1990 Mercedes 560SEC AMG, a factory widebody by AMG at the time. I once sat in a car almost exactly like this one. It was one afternoon in LA. One perfect afternoon. I stuck my head into rarified air that afternoon. You should as well. I do not know why this 1978 Dastun 280Z wandered into Mecum from its usual Craigslist zone, but here it is, with a shadow over the front. You know these L engine straight sixes later came turbocharged from the factory? Nice idea for a project, I would say. Given that you now also have a project car, what you need is a durable and somewhat dent-able off-roader. For that, there is this license-built 1983 Mitsubishi Jeep. It has Bride seats. It has body color wheels. It is very choice. You would be remiss not to have a race car. For that there is this 2000 “Chevrolet Camaro,” a 640 horsepower class winner at the 24 Hours of Daytona. They’re looking for $55 to $85,000. Good buy. Find all the lots here. I hope that this has been informative. We'll Be At Pebble This Year!